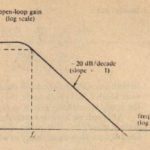 Once again we see that the closed-loop gain reduces to the ideal amplifier value. -RlR” when A = 00. Notice that the denominator of (13-28) is the same as that of (13-21). the equation for the closed-loop gain of the noninvcrting amplifier. Furthermore. 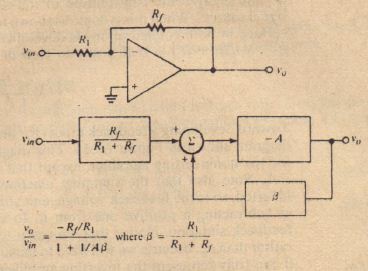 the quantity RI/(UI + R,) is also the feedback ratio f3 for the inverting amplifier. This (act is illustrated in Figure 13-10. which shows the feedback paths of both configurations when their signal inputs are grounded. 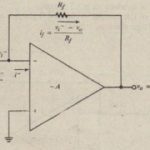 Think of the amplifier output as a source that generates the feedback signal. 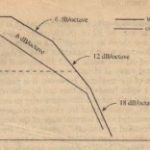 By the superposition principle. Toward developing a feedback model for the inverting amplifier, consider the block diagram shown in Figure 13-11. 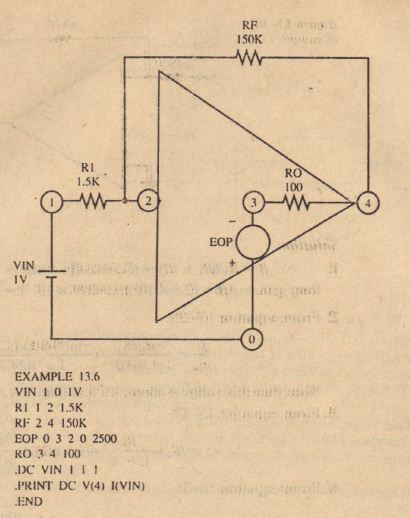 This diagram is quite similar to Figure I3-X(b) for the noninverting amplifier, except that we now denote the open loop gain by A. Note also that the summing junction now adds its two inputs. Since v” is inverted, so is the feedback voltage, and adding a negative voltage to v is the same as subtracting a positive one from it. In other words, we still have a negativefeedback situation. 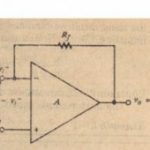 Notice that we use v to represent an arbitrary input voltage, rather than Vii” because we will have to make some adjustments in this model before it can truly represent the inverting amplifier. Equation D-.B shows that multiplication of the model equation by the constant R/(RI + Rf) gives liS exactly the same result (equation D-29 with V 1/, = 11) that we obtain for the inverting amplifier. Therefore, we modify the block-diagram model in Figure 13-11 by adding a block that multiplies the input by /(/(NI + R,). The complete feed hack model is shown in Figure 13-12. 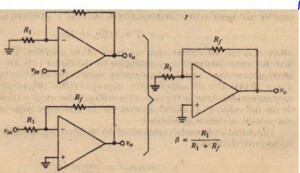 This equation confirms that the input resistance is HI for the ideal inverting amplifier. where ;\ = co , II also shows thai the input resistance decreases with increasing values of A. 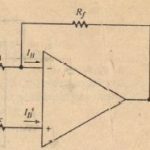 Use SPICE to find the closed-loop voltage gain. 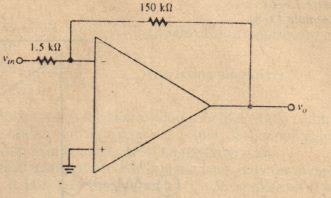 the input resistance seen by VII/. 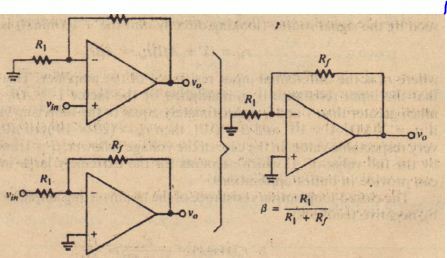 SPICE and the output resistance of the inverting amplifier in Example 13-5. Solution. Figure 13-14 shows how we can use a voltage-controlled voltage source (EOP) to model an operational amplifier in SPICE. Notice that the inverting property of the amplifier is realized by connecting the positive terminal (N +) of EOP to ground (node 0). 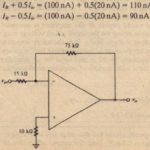 The voltage source is controlled by the voltage between nodes 2 and 0 (NC+ and NC-. respectively). Thus. node 2 corresponds to the inverting input of the amplifier in Figure 13-13. Notice that till! simulated amplifier has infinite input impedance. since there is ,HI open circuit between nodes 2 and O. Since VIN = I V. the output voltage at node 4. 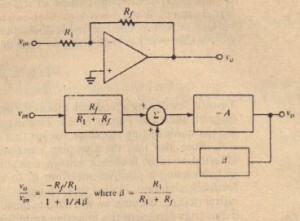 V(4), is nurncricnlly equal to the dosed-loop voltage gain. The results of a program run reveal that V(4) = -96.11, in close agreement with till! gain calculated in Example 13-5. SPICE computes the magnitude of I(VIN) to he n.MI 1111\. so the input resistance.